Rotherham Harriers once again excelled as a club at the English National Cross Country Championships held, for once, in good weather conditions at Woollaton Park in Nottingham last weekend. The Senior Ladies team members were the stars of the show as they demonstrated magnificent strength in depth to win their first ever medal at this event with an excellent third place. In an event with well over 700 individual entries and against 83 teams comprising the cream of the country's middle distance runners this was a superb performance. Winning a medal against such a high level of competition with a team all born, raised and trained in Rotherham illustrates the magnificent work done by the team at Rotherham Harriers and the major contribution the club, and the facilities at Herringthorpe stadium make to the town. The Senior Women's team consisted of Sam Johnson (23rd 30.19), Laura Spence (29th 30.41), Steph Burns (31st 30.50) Robyn Lancely (44th 31.29), Annabelle Grady (49th 31.41), and Jess Fawcett (70th 32.22). Despite the fact that they were unable to beat the traditional powerhouse of Aldershot and District (who fielded 3 international athletes) they were close behind silver medallists Charnwood and well ahead of the fourth placed team – another traditionally very strong club in Belgrave Harriers. Excellent packing, with all of the girls in the top 10% of the field, ensured this result and is a testament to the strength of the squad. The senior men were also breaking new ground as they recorded their best team result for many years with 19th place in the 9 man team scorers and 24th in the 6 man team event. With a field of almost 1700 runners and 127 teams this was a brilliant result with the club having 11 finishers and 8 in the top half of the field. Team members were Richard Harris (147th 40.31), Aidan Johnson (222nd 41.42), Kyle Craib (235th 41.29), Phil Hoole (271st 42.17), Gareth Sampson (339th 43.04), Sam Clegg (347th 43.08), John Comrie (619th 46.30), Howard Darwin (820th 48.46), Matt Jones (932nd 50.04), Jonathan Maxfield (1220th 54.08), James Gallacher (1444th 58.38). The Junior Women were also in good form as they finished in 8th place with all their runners in the top 100 in a field of almost 200. The team consisted of Natasha Hatswell (32nd 24.24), Mary Jenkinson (54th 25.07), Emma Parkinson (68th 25.52), Jess Mangham (86th 26.52) Emma Dutton (93rd 27.14). The U 13 Girls also finished a full team. With almost 450 runners and 53 teams entered the team members all ran well with Mya Taylor (35th 12.49) and Grace Harris (71st 13.08) taking top 100 places. Keiva Rennocks (213th 14.08) and Bronte Rennocks (272nd 14.34) providing good back up to earn the team 18th place. Although an outbreak of various virus infections meant that the club were unable to field teams in other sections there were many good individual performances to cheer. Kane Smith took an excellent 68th place in a field of 350 U15 boys; Ryan Beale led in an incomplete team of U17 Men with an excellent 61st place out of almost 300 runners. He was followed in by Devon Stead (121st) and Daniel Bradford (220th); Matt Stevens also led in an incomplete team in the U13 Boys as he took 71st place in a field of 400. Jack Stokes (253rd) and Liam Mortimer (363rd) followed him home. In the Junior Men's race there were 200 runners and Elliot Smales got in some valuable triathlon training with an 83rd place finish. Ollie Watson (162nd) and Aidan Kidder (166th) also represented the Harriers in the race. 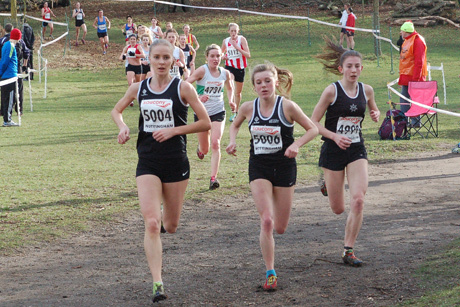 Maisie Elliott (172nd) and Ruby Torry (194th) completed the Rotherham Harrier's entries in the U17 Women’s race. Overall this was an outstanding day for the club with excellent running across the board and a Bronze medal in a major national championship providing the icing on the cake. For a small town club competing against all of the top clubs in the country these are excellent results and a tribute to the coaches, managers and organisers who make everything possible.